The Bowflex TreadClimber TC5500 is the newest member of the TreadClimber family, designed with a new technology called G.O Coach or Goal Oriented programming that will help you set and achieve your desired fitness goals. Its price, however, is something you should consider. At $3,299, make sure that this is what you really, really wanted. If you have money to burn for a single-unit fitness machine, then by all means, get the TreadClimber TC5500. Take note, however, that its price will already allow you buy multiple gym equipment with different functions. At first sight, the Bowflex TreadClimber TC5500 may seem extraordinary. It features a readout window for 15 critical fitness stats and measurements, including distance, time, speed, calorie count, custom, HR workout, and nine landmark challenges. Like the other Bowflex TreadClimber machines, the TC5500 features a Climb Indicator that monitors your distance as you progress with your work out. Another great feature of the TC5500 is that it can store multiple user profiles which is perfect if you are not the only one who will use the machine. The TreadClimber TC5500 is built with Bowflex’s new technology called G.O. Coach or goal-oriented programming. This aims to track your specific work out goals, which would help you be aware of your fitness routine status and whether or not you are already achieving them. While it’s supposed to be a treadmill, an elliptical trainer, and a stepper in one unit, the combination does not really mix well and your movement doesn't feel natural. It comes with heavy weight and an impressive frame, but the interior parts are not remarkable and durable enough to last long. The motor is not as powerful as that of other advanced gym units, while the design is not sturdy enough as it is composed of several low-quality plastic parts. The machine does not provide any labor warranty, so having it repaired when the motor fails will cost you a lot. Like the TC5000 unit, the TC5500 machine is also backed by Bowflex 100% Satisfaction Guarantee. However, it only covers you for a maximum of six weeks. Your limited money back warranty might not be long enough to cover all those soon to be defects of the fitness machine. The Bowflex TreadClimber TC5500 is obviously over-priced for its features. Even if you have a budget of $3,300, it would not be worth buying because you can buy a much better fitness machine for less with more efficient features that will give you the same results. 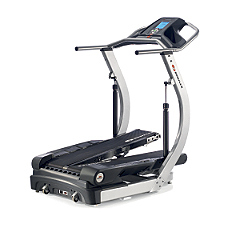 If you plan on buying a Bowflex TreadClimber TC5500, I suggest you buy from Treadclimber.com. They usually have this for just $3,299.